Somewhat similar to “heavy hors d’oeuvres” in that your guests will leave your event “satisfied” or even “full”. This menu style compliments the current “grazing” trend. Small plates of food/meal combinations are passed in courses by our serving staff. Each plate may be a miniature version of an entrée or soup or salad. Each plate may have several food components such as meat, vegetable, and starch, but in small portions. One small plate by itself would not satisfy a hungry person, but several small plates served over one or two hours will be a satisfying and unique meal experience for anyone! Average 4-5 hors d’oeuvres selections. This is a menu where you plan to give your guests just a light snack along with cocktails. Hors d’oeuvres are served buffet style, generally with a small plate and fork. This is just a light snack and some guests may leave your event hungry. If you plan to hold an event over a lunch time (11:00 a.m. – 1:00 p.m.) or dinner time (5:30 p.m. – 7:30 p.m.), you may want to consider another menu style. Average 4-5 hors d’oeuvres selections. This is also a menu where you plan to give your guests just a light snack along with cocktails. Only “finger-friendly” foods are passed by servers with cocktail napkins. This is just a light snack and some guests may leave your event hungry. If you plan to hold an event over a lunch time or dinner time, you may want to consider another menu style. A full meal where menu items are served in various areas of your venue at several tables in a buffet style. Often, each station has a specific theme. For instance: Pasta Station, Seafood Station, Vegetarian Station, Asian Station, or Dessert Station, and MANY other options. Stations can also be combined with a chef to prepare items to order. This type of menu style often allows guests to circulate more and to get a wider sampling of menu items compared to a standard buffet. A full meal served in courses to seated guests. Seating assignments work well for this menu option. Standard plated meals often include: Served Course of salad/soup/appetizer; Served Plated Entrée Course including 1-3 meat entrees, 1 starch, 1 vegetable, and dinner rolls with butter; followed by a Dessert Course with Coffee. Cake/Dessert and Coffee can be served to the guests at the seated tables or served station style so that guests can circulate more. 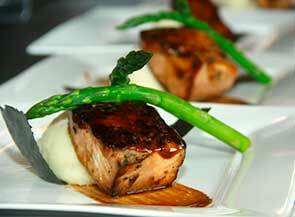 Plated meals will create an extended formal feel to the event. 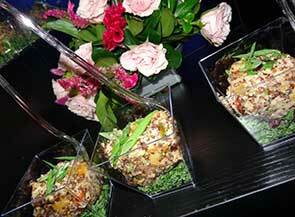 Plated Events generally increase costs by 3-4 times the cost of a buffet event. 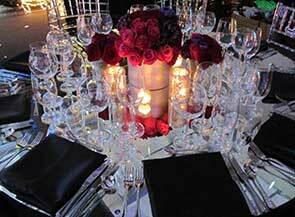 A full meal where menu items are served on platters and in bowls, trays, and chafers on one main buffet table. Guests help themselves to the buffet. Servers clear the plates and guest tables when guests are finished eating. The standard buffet generally includes at least: 1 salad, 1 vegetable, 1 starch, 1-3 entrées, and dinner rolls & butter. Download the Wedding Reception Menu here. Serving Staff and China are included in Menu Pricing. Linens are an additional charge. All menus are subject to 20% Service Fee and Applicable Taxes.